Hello! It’s Courtney again from Paperelli. I hope you have being loving your fall season. Have you started thinking about Christmas yet? It’s totally coming … and in only 6 weeks! Being in the paper business, I have been designing Christmas cards for months now. I am definitely ready for the gingerbread houses, hot cocoa, Christmas lights, and the smell of fresh pine. One of my favorite things to decorate with at Christmas time is gold and silver and glitter! 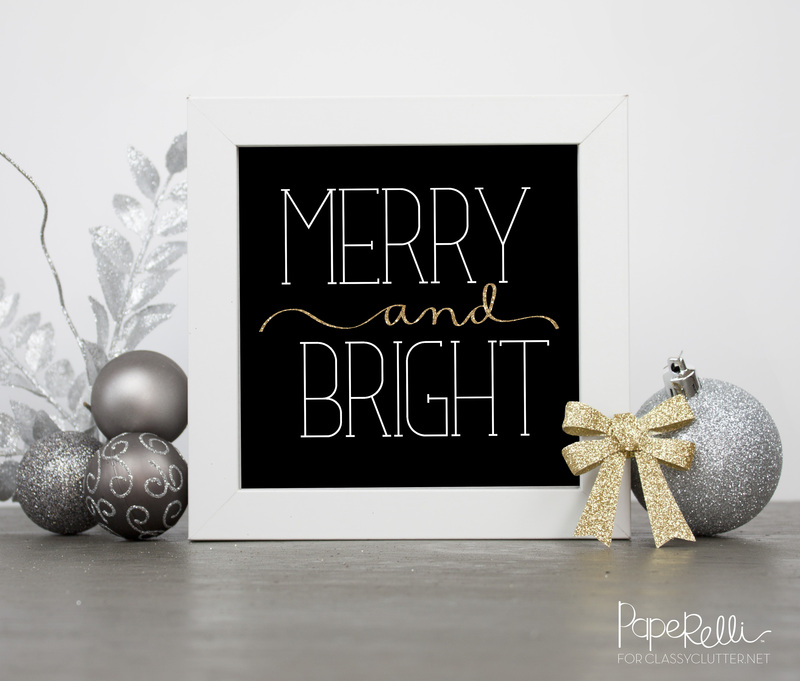 Today I have two free printables to match your sparkling Christmas décor. The first one is a Merry and Bright printable, designed to fit in your favorite square frame. You can choose between an 6”, 8”, or 12” print. 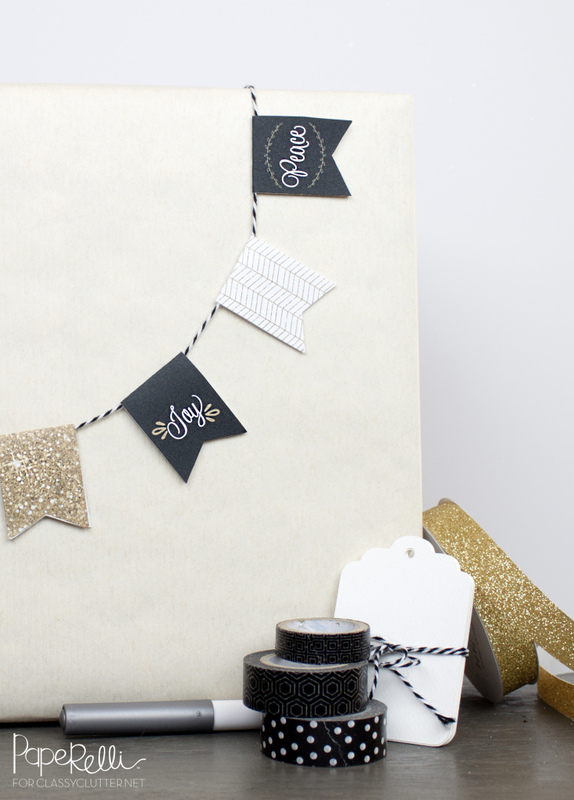 Wow your friends and family by adding metallic glitter accents and this printable to your Christmas décor. Any of you who have been following me on my Pinterest may have noticed my slight obsession with gift wrapping. I have an entire board dedicated to gift wrapping ideas. Who doesn’t love receiving a beautifully wrapped gift? That is why I have another printable to help you wrap your own beautiful gifts this Christmas season. Download the PDF here. After you have printed your Mini Gift Wrap Flags, cut each of them out and fold over your favorite twine. Then, wrap your mini flag banner around your gift to complete the look. Ta da! It’s time to get going on decorating, gift wrapping, and holiday treat baking! What are you going to do this year to make the most of your Christmas season? Have you ordered your Christmas cards yet? Check out our Paperelli Holiday Collection in the shop! I love these printables (and love so much of the content on your site) but can’t seem to make the links work to download them – keeps coming up as 404 content not found. ANy suggestions? I can not get the links to work,and would love to know how you made the gold flag too! I looooove the colors in this printable! Yay!! I totally dig the black and gold this winter. Thanks Paperelli and Classy Clutter. Ladies, you’re my go to blog!! Thank you for this printable. It’s so cute! exactly what I was looking for. THANK YOU SOOO MUCH for providing the flags!